Hello everyone my names Matt. I have recently decided that I want the total weight of my backpack and its contents reduced to make for a more enjoyable experience while backpacking. Im considering a Columbia Silver Ridge 35L internal frame mainly due to size, weight, and price it's only like $75.00 right now. I will only be using it during the warmer months, money is tight, minimal weight, 20# max weight, and 1-4 day trips max. Would this be an appropriate backpack for what I want? Any help or suggestions would be greatly appreciated thank you. what may in many circumstances be only clarity; seeing clearly what there is to be done and doing it directly, quickly, aware � looking at it. The question is: can you put 4 days worth of gears in a 35L pack? I tried to fit that much stuff into my hunting backpack and couldn't its probably 35 liters. I guess in my head it seemed like my stuff took up less space lol sorry. I have a low budget to work with I checked the gear list on here would you recommend maybe a 50 liter pack? Pack You'll be hard pressed to find another pack in that size and price range at that weight. Thanks for helping me pass the time at work. The other options is to keep browsing outdoor forums, craiglist, eBay, etc., for a used one. I just got a Lowe Alpine Zepton 50 from Steepandcheap for $60. 2.5 lbs, aluminum stay, 50 liters, pack body uses dyneema fabric. I'd recommend looking around for one online, it's pretty awesome. If your back is the right size for it. If you really, really, really aren't going over 20 lbs max weight, though, you should be able to get a sub 2 lb pack that does what you need. Probably sub 1.5 lbs. You don't really need a metallic frame at those weights, plastic and foam can give good weight transfer. 50L is a pretty good target for a 2 to 4-day pack. Presuming you don't have a bulky bag, sleeping pad, shelter or a lot of clothes, it's enough volume. I like the ability to strap gear outside (e.g., shelter, pad, etc.) because the food, at least at the beginning, can take up a lot of space. A big, stretchy back pocket is a plus, too. Because there are hundreds to choose from, narrowing it down is a chore. I'll only suggest never overlooking fit in search of a bargain. Get all your gear first then decide what size pack you'll need. If you are happy with everything else then get a pack. Do you have any outfitter stores near you? Go in and try on every pack that fits what you need. Buying one online without trying it can work but often ends with either a returned pack or a poor fitting pack that you try to tolerate because you spent the money. The most important part of a backpack is fit, fit and fit. It has to fit your body, it has to fit your gear and it has to be comfortable for you while carrying the gear inside (totally different feel than with sandbags or other weights). Backpack fit is almost as individual as shoe fit. That's why it's strongly recommended to get all your other gear before shopping for a backpack. Add the equivalent in weight and bulk of a week's food and a day's water, box everything up and take it to the store (or have it ready to try on when you receive your mail-order pack, and hike around the house for a couple of hours, while you can still return the pack). The articles on the home page of this site, left hand column will give you lots of tips on gear selection, including your pack. I could use a 35 liter backpack, too, if I didn't take any food. For a week out, I need 40 liters. Your (and everyone else's) Mileage May, of course, Vary! Also remember that liter ratings aren't always consistent from manufacturer to manufacturer, and the loading and construction style of the pack itself. My REI Lookout 40, for example, only seems to carry as much as other manufacturers' 30 liter packs. Great pack, I love it, but despite being rated 40 liters . . . it's a large day pack, not an overnighter. Well, maybe one night. I actually like that about it, though. I got it my senior year of college because I wanted a book bag with an aluminum stay. Perfect for carrying 20 lbs of books to class, and has stood up to going on 6 years of use and abuse across three continents. Thank you all for your helpful advice. I do have the gear however i am waiting on a new lighter stove. I'm thinking about the Columbia Endura 65 liter bag. I'm a big fan of Columbia's gear but I will look into the other packs mentioned thank you for the alternatives. The only outfitter nearby is Gander Mountain very limited Selection and all near the $200.00 range. I will look again to see. What they have in the 50-+ range and try them on. I would love to go to REI but it's in Pittsburgh and its 60 miles away. So a friend of my Gfs dad gave me two external frames. One is a academy Broadway it's surprisingly light and the other idk what brand but it's much heavier. After I replaced the waist band on the academy its perfect fits great, transfers weight superbly, and weighs under 4#'s. Only downside is with my summer gear it's larger than needed but I like it and hope to.get an internal still. if the old external is relatively light, an feels good to you, heck *use it* - after a few trips with it you can decide what parts of your gear you want to invest in lighter options. Nothing beats experience with the gear for that, as you get a "system" of how you like to pack things, and make them work together. even before you invest in the super high tech UL gear, your biggest asset to backpacking light is the experience in your brain, and how you stay comfortable without putting your whole house on your back. 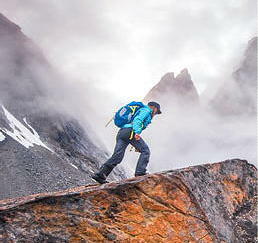 You can practice that very effectively with older gear and hand-me-downs - If you can end up with a weight of 15 to 20 pounds in that old bag including it, before you add food water and fuel, you're probably doing better than 90% of the people on the trail anyway, and as you get out you'll figure out what you want to replace first. And don't wait for a stove. Find some meals that work with just boiling water, make a Penny stove (the one I use) or a cat stove, look at a few people's lists here and get out a few times. Well thank you I have been learning more and more after each trip I am going lighter and smarter every time.